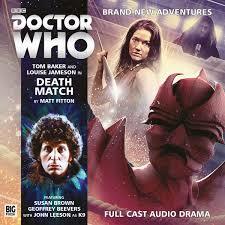 Following the intriguing events of ‘Requiem for the Rocket Men’ in which Leela departed the TARDIS to pursue her relationship with Marshall, ‘Death Match’ serves as an indirect sequel of sorts that deals with the ramifications of that choice, offering wonderful moments of characterization and bringing the Master much more to the forefront in the process. With societal elites’ champions vying for their very lives against each other and the environment, danger is rampant as the only rule is to kill or be killed. It’s inevitable from the start given known continuity that Leela will end up back with the Doctor, but it’s nonetheless immensely satisfying to see the effect that Leela’s absence has aboard the TARDIS as the Doctor and K9 grow increasingly agitated with each other. At the same time, even as the Master becomes much more than a tangential threat as he was in the preceding tale, it’s intriguing to note the disparity of viewpoints and morality that the two Time Lords hold, the Master convinced that their race has the inherent right to decide the order of things as well as who lives and who dies whereas the Doctor is content to merely visit new worlds on a lark to broaden his horizons. This dichotomy has, of course, been discussed before, but Tom Baker and Geoffrey Beevers imbue their interactions with such gusto and flair that it’s hard not to be entranced regardless of the topic on hand. Yet while the Master is wisely treated as a regular character rather than as a cliffhanger surprise, ‘Death Match’ is very much a story about Leela who brazenly displays a wide range of emotions and eventually opens up much more than ever seen before. Her sentimental reunion with the Doctor is played to excellent effect, showing just how much these two mean to each other and how perfectly the Doctor can understand his companions and their plights. Even if putting Leela into a death match scenario isn’t a novel concept, it’s pulled off remarkably well, and her battle against the Red Giant is suitably tense and satisfying. ‘Death Match’ continues the trend of injecting some vitality into a range that had become a bit too comfortable with tradition, and the genuine excitement stemming from the staged battles easily forms the narrative backbone here. However, as good as the performances are throughout, there will still be those who are a bit wary of the overall Leela storyline of this two-parter. Although a rash decision to pursue a relationship does fit her characterization given the manner in which she eventually leaves the Doctor’s side permanently, her choice to leave with Marshall still doesn’t quite get the payoff it needs here. The two say all the right words with the right emotions to suggest that they do truly care for one another, but there are few actions shown to support this, and the passing of time between the two stories as their relationship developed unseen robs Marshall’s eventual heroic sacrifice of some of its impact. Nonetheless, this storyline does unfalteringly pave the way for Leela to show her more vulnerable and emotional side, making her future decision more plausible as well. With fast-paced action and intrigue upon a wonderfully visual world, ‘Death Match’ continues to infuse new energy into The Fourth Doctor Adventures, making the most of established characters while further exploring their seldom-seen sides. The premise may not be the most imaginative, but it maintains recent momentum and hopefully will lead to further development and refinement of the unique relationship between the Doctor and Leela going forward.